Club Penguin Cheats by Mimo777 Club Penguin Cheats by Mimo777: Club Penguin Halloween Party Countdown! Did you notice the count down? Awesome, huh? I can't wait, can you? I hope so! That would be so awesome! Guess what I am for Halloween! A pirate! 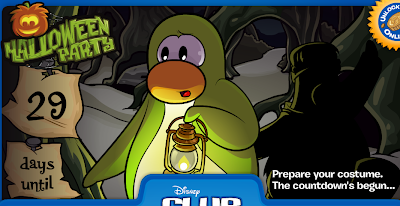 On Club Penguin, too! I have a question, Mimo. Do you still wear a costume and go Trick-or-treating? I am just wondering! Ya Mimo made a post about that awhile ago. They take out Easter and they call it a holiday party rather than Christmas.